Convocation (May 26–June 3) represents the very best of McGill, past, present and future. It is a rite rooted in the past. Steeped in tradition, the ceremonies pay homage to a bygone era while infusing them with new life. Every robe that is donned, every procession piped in, every time the Chancellor taps a graduating student with his cap – each symbolic garment and gesture is renewed by the enthusiasm and earnestness of Convocation’s participants, be they on stage or in the audience. It is also the most wonderful snapshot of the present. Literally. Be it selfies with the statue of James McGill, class pictures on the steps of the Arts Building or portraits with family and friends in front of the Roddick Gates, no other event at the University is captured as frequently or with as much pride as is Convocation. This is culmination of years of hard work and dedication of students; the support and encouragement of friends and family; and the commitment and professionalism of faculty and staff. Some 5,000 students will take the short walk across the stage during the week and every one is a celebration of a job exceedingly well done. But, most importantly, Convocation feeds the future with promise. The proud young men and women tossing their mortarboards into the blue sky today will be tomorrow’s law-makers, educators and artists. Like their fellow alumni before them, the Class of 2015 will go on to great things. They will cure and build and teach and lead. In short, they will pass on the valuable lessons they learned here at McGill and they will help make the world a better place. Each ceremony will last approximately two hours. Graduating students are asked to respect the limit of four guests. Seating is on a first-come, first served basis. Additional guests or friends and family who can’t attend a ceremony in person can watch the proceedings via live webcast. In order to view the live webcasts you will need to make sure you have Microsoft Silverlight plug-in enabled on your computer. Follow McGill on Facebook, Twitter and Instagram for images and stories about the week’s activities. Email photos you’d like to share and we’ll share the best. 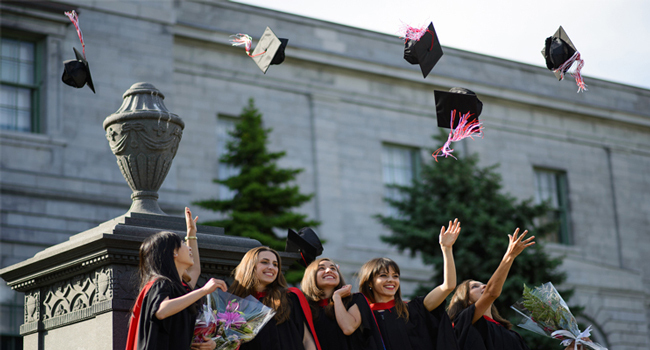 Post your special grad moments and congratulate the new grad on social media with tweets, vines, photos or short videos, using the hashtag#McGillGrad2015. Highlights will be shown in a virtual album.